Coast Diamond is pleased to announce Skatell’s Jewelers of Greenville, South Carolina as our featured retailer of the week. Join Skatell’s Jewelers this Friday, April 29, 2016 and Saturday, April 30, 2016 for their Bridal and Diamond Event! You can enter to win a FREE Weekend Getaway at the beautiful Westin Poinsett in Downtown Greenville plus a $200 Visa Gift card for your weekend entertainment. PLUS, Skatell’s will be offering special financing during the event weekend, with 0% APR for 36 months. Stop in this weekend to choose the perfect Coast Diamond engagement ring or Mother’s Day gift for the special woman in your life. Click on the Coast Diamond rose gold engagement ring below for full details. Since 1964 Skatell’s Jewelers has been diligently serving Greenville and Upstate South Carolina’s jewelry needs. As a third generation family owned business, Skatell’s believes partnering with local charities and community projects is an important way of showing their commitment to the community and earning your business. For 50 years, customers have enjoyed the superb customers service provided by Skatell’s Jewelers in their 5,000 square foot showroom, where they have once-in-a-lifetime engagement rings and memorable gifts for those very special moments in life, like Mother’s Day. Skatell’s Jewelers is an authorized dealer of Coast Diamond jewelry designs by Jay Gilbert. When you stop in this weekend or anytime you will find graceful and stylish designs that she is sure to say yes to. 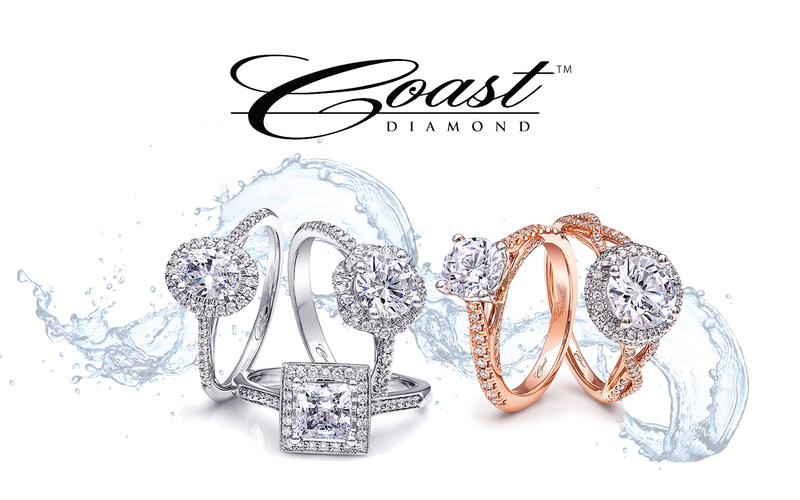 Here is just a peek at a few Coast Diamond designs available at Skatell’s. Skatell’s Jewelers: Coast Diamond 1 CT cushion-shaped halo engagement ring (LC5381) with a high polished yellow gold band. Skatell’s Jewelers: Coast Diamond Signature Color Collection oval sapphire ring surrounded by a halo of dazzling diamonds. Skatell’s Jewelers: Coast Diamond timeless 1 CT round halo engagement ring (LC5448). Congratulations Skatell’s Jewlers of Greenville for being selected Coast Diamond’s Featured Retailer of the Week! Coast Diamond is pleased to present Blumenthal Jewelers of La Mesa, CA as Featured Retailer of the Week. Blumenthal Jewelers began in 1978 with Guy Blumenthal’s desire to follow in his father’s footsteps and open a shop to specialize in watches and watch repair. His passion and thurst for knowledge did not stop with watches, but carried into jewelry and design, and soon Blumenthal Jewelers was one of the premiere, full-service jewelry stores in the San Diego, CA area. Coast Diamond is proud to be a part of Blumenthal’s passion for finding the perfect piece of jewelry that suits each customer’s unique personality. Coast has finely crafted, uniquely exquisite jewelry designs. The dazzling halo engagement ring – An anniversary band that tells your loved one you are hers for eternity… Which of these Coast Diamond designs is perfect for the love of your life? Blumenthal Jewelers: Coast Diamond 1 CT petite cushion-shaped halo engagement ring (LC5410) with matching wedding band (WC5410). Blumenthal Jewelers: Coast Diamond floral halo engagement ring (LC6026) with milgrain edging and fishtail set diamonds on the split-shank. Blumenthal Jewelers: Coast Diamond eternity band (WC10180) featuring a high polished band and a diamond band, woven together. Congratulations to Blumenthal Jewelers of La Mesa, CA for being selected Coast Diamond’s Featured Retailer of the Week! Coast Diamond is pleased to announce Nederland Jewelers of Beaumont & Nederland, TX & Lake Charles, LA have been selected Featured Retailer of the Week. Like Coast Diamond, Nederland Jewelers began in 1978 in Nederland, Texas. Paul Wojcik’s experience in the jewelry industry began at the young age of sixteen, in the repair department of his parents’ jewelry store. Today, he and his wife, Gladys, carry on his parents’ legacy, continuing to build their business on exceptional customer service and the best prices for any item their customers desire. Fine jewelry, watches and precious collectibles are all available at Nederland Jewelers. You can have confidence you will find classic and contemporary styles that suit your taste, because Paul and Gladys are always seeking the very best pieces in the jewelry market. Over the years, the growth of Nederland Jewelers resulted in the addition of stores in Beaumont, TX in 2003 and Lake Charles, LA in 2006. Paul and Gladys have placed a graduate of the Gemology Institute of America (GIA) in each store to oversee the purchase of every diamond. Nederland Jewelers is also a member of Jewelers of America, a distinct honor awarded to independently owned jewelry stores across the US, that uphold the strictest of ethical standards. The graceful and stylish designs of Coast Diamond’s Jay Gilbert are exactly what Nederland Jewelers seeks when providing their customers with the most current designs and the highest quality in fine diamonds. This Mother’s Day stop into Nederland Jewelers to find the perfect gift. And if a spring engagement is in your near future, stop into Nederland Jewelers and try on these timeless Coast Diamond halo engagement rings. Nederland Jewelers: Coast Diamond elegant cushion-shaped halo engagement ring ( LC5256) with diamond encrusted shoulders. Nederland Jewelers: Coast Diamond custom oval-shaped halo engagement ring (LC5410) set in platinum with petite diamond encrusted shank. Nederland Jewelers: Coast Diamond dazzling floral-shaped double halo engagement ring (LC10137) suitable for a 1.5CT center stone. Congratulations to Nederland Jewelers for being selected Coast Diamond Featured Retailer of the Week! Coast Diamond is proud to call Allen’s Jewelers of Charlotte, North Carolina our Featured Retailer of the Week! For over 25 years Allen’s Jewelers has brought quality and design in the jewelry industry to Charlotte, NC. Karen Allen is the owner and operator of Allen’s. She is a graduate gemologist of the Gemological Institute of America and a Certified Gemologist with the American Gem Society. You must buy your Coast Diamond engagement ring from Allen’s Jewelers in Charlotte, because you will have a jewelry buying experience like no other. Allen’s Jewelry is known for their outstanding colored gemstones, a huge trend in engagement rings today. Choose one of our stunning Coast Diamond engagement ring settings and let Karen and Allen’s Jewelry find the perfect center stone. Allen’s Jewelers: Coast Diamond delicate engagement ring (LC10186) with scalloped, diamond encrusted shoulders, suitable for a 1CT center stone. Allen’s Jewelers: Coast Diamond elegant wedding set (LS10005, WS10005) with fishtail-set diamonds on the shoulders, suitable for a 1 CT center stone. Stackable wedding bands are the wedding trend in jewelry. They are a perfect pair with either Coast Diamond engagement ring above, or worn all by themselves. Set with colored gemstones or sparkling diamonds, any twist or shape, stackables are the perfect gift of jewelry for a loved one. Allen’s Jewelers: Coast Diamond stackable wedding bands in rose, white or yellow gold or platinum. We hope you will stop into Allen’s Jewelers in Charlotte and experience the wonderful customer service everyone is talking about for yourself. Congratulation Allen’s Jewelers of Charlotte for being this week’s Coast Diamond Featured Retailer!